Although the majority of active duty U.S. Army soldiers are full-time personnel in the Active Component (AC), a substantial minority of soldiers on active duty are in the Reserve Components (RCs). These “citizen-soldiers” (Army National Guard and Army Reserve) represent a force available for rapid activation in times of national need. RC soldiers experience many of the same stressors as AC soldiers as well as stressors that are unique to their intermittent service. Despite the important role of RC soldiers, the vast majority of military mental health research focuses on AC soldiers. One important goal of the Army Study to Assess Risk and Resilience in Servicemembers (Army STARRS) is to address this gap. Here we examine predictors of suicide attempts among activated RC soldiers. This longitudinal, retrospective cohort study used individual-level person-month records from Army and Department of Defense administrative data systems to examine socio-demographic, service-related, and mental health predictors of medically documented suicide attempts among activated RC soldiers during 2004–2009. Data from all 1103 activated RC suicide attempters and an equal-probability sample of 69,867 control person-months were analyzed using a discrete-time survival framework. Enlisted soldiers comprised 84.3% of activated RC soldiers and accounted for 95.7% of all activated RC suicide attempts (overall rate = 108/100,000 person-years, more than four times the rate among officers). Multivariable predictors of enlisted RC suicide attempts included being female, entering Army service at age ≥ 25, current age < 30, non-Hispanic white, less than high school education, currently married, having 1–2 years of service, being previously deployed (vs. currently deployed), and history of mental health diagnosis (particularly when documented in the previous month). Predictors among RC officers (overall rate = 26/100,000 person-years) included being female and receiving a mental health diagnosis in the previous month. Discrete-time hazard models showed suicide attempt risk among enlisted soldiers was inversely associated with time in service. Risk factors for suicide attempt in the RCs were similar to those previously observed in the AC, highlighting the importance of research and prevention focused on RC enlisted soldiers in the early phases of Army service and those with a recent mental health diagnosis. Rates of non-fatal suicide attempts and suicide deaths among U.S. Army soldiers increased during the wars in Iraq and Afghanistan [1–3], with elevated risk persisting among veterans who have left the military [4, 5]. Most research on non-fatal suicide attempts has focused on the full-time soldiers within the Army’s Active Component (AC) (e.g., [6–8]). Suicide attempts among soldiers in the Reserve Components (RCs), which also increased during the wars , have received much less attention. The RCs include the Army National Guard and Army Reserve, comprising approximately 53% of the total Army population (all active and inactive soldiers) in 2017 . These “citizen-soldiers” augment the AC as needed during wartime, returning to their communities, civilian jobs, and/or college studies after deployment. In addition to their unique role and circumstances, RC soldiers may differ from the AC on mental health outcomes (e.g., stress, anxiety, and depression) and risk for suicide ideation and attempt [11–14]. Improved understanding of suicide attempt risk within the RCs can inform targeted intervention programs for this substantial proportion of the Army population. Most previous findings on non-fatal suicidal events within the RCs are based on survey research (e.g., [15–17]). Few studies have examined suicide attempts documented in the administrative medical records of RC soldiers, which are particularly important owing to their impact on the Army healthcare system. Univariable analyses indicate that documented attempts are more likely among RC soldiers who are female, younger, less educated, and never married . Here we used 2004–2009 administrative data from the Army Study to Assess Risk and Resilience in Servicemembers (Army STARRS) to examine multivariable associations of socio-demographic, service-related, and mental health predictors with suicide attempts among activated RC soldiers. The Historical Administrative Data Study (HADS) is a component of Army STARRS that integrates deidentified records from 38 Army and Department of Defense administrative data systems . The study was approved by the institutional review boards of the Uniformed Services University, University of California, San Diego, Harvard Medical School, and University of Michigan Institute for Social Research. In this longitudinal, retrospective cohort study, we focused on the active-duty person-month records for the 743,171 RC soldiers (i.e., U.S. Army National Guard and U.S. Army Reserve) who were federally activated under Title 10 from January 1, 2006 through December 31, 2009. During that time there were 1103 RC soldiers with a documented suicide attempt (1056 enlisted soldiers, 47 commissioned and warrant officers). Person-month data were analyzed using a discrete-time survival framework , with each month in a soldier’s career treated as a separate observational record. In order to reduce computational intensity, we selected an equal-probability 1:200 sample of 69,867 control person-months (58,895 enlisted soldiers, 10,972 officers). When control person-months are randomly subsampled and weighted, discrete-time survival coefficients can be estimated without bias . Prior to selection, the population of control person-months was stratified by gender, rank, time in service, deployment status (never deployed, currently deployed, or previously deployed), and historical time. The control sample excluded all person-months in which a soldier died or had an administratively documented non-fatal suicidal event (e.g., suicide attempt, suicide ideation) . To adjust for under-sampling, control person-months were weighted to 200. Administratively documented suicide attempts were identified using Department of Defense Suicide Event Report (DoDSER) records and ICD-9-CM E950-E958 diagnostic codes (indicating self-inflicted poisoning or injury with suicidal intent). The DoDSER is a suicide surveillance program in which medical providers at DoD treatment facilities use a standardized reporting form to document suicidal behaviors . The Military Health System Data Repository, Theater Medical Data Store, and TRANSCOM (Transportation Command) Regulating and Command and Control Evacuating System (Additional file 1: Table S1) were used to identify ICD-9-CM E950-E958 codes documented during healthcare encounters at military and civilian treatment facilities, as well as during combat operations and aeromedical evacuations. Records indicating suicide death or only suicide ideation (without an attempt) were excluded. We also excluded the E959 code (late effects of a self-inflicted injury) because it confounds the temporal associations between risk factors and suicide attempts . Cross-referencing of the different data systems was conducted to ensure that all cases represented unique soldiers. When multiple suicide attempts were documented for a single soldier, a hierarchical classification scheme was used to select the first attempt . Administrative records were also used to construct variables for socio-demographic characteristics (gender, age at entry into Army service, current age, race, education, and marital status), active time in service (based on the number of months an RC soldier was activated), deployment status (never deployed, currently deployed, or previously deployed), and previous mental health diagnosis (Additional file 1: Table S1). The indicator for any previous mental health diagnosis was constructed using ICD-9-CM mental disorder codes, excluding postconcussion syndrome, tobacco use disorder, and supplemental V-codes (Additional file 1: Table S2). Recency of mental health diagnosis was determined by calculating the number of months between the most recently recorded diagnosis and the subsequent suicide attempt (cases) or sampled person-month (controls). Analyses were conducted using SAS version 9.4 . Enlisted soldiers and officers were examined separately owing to their different socio-demographic profiles, Army training and career experiences , and risk of mental health problems [25–27] and suicidal behaviors [8, 28–30]. Discrete-time person-month survival analysis with a logistic link function was used to examine multivariable associations of socio-demographic characteristics with suicide attempt. This was followed by a series of multivariable models (adjusting for the socio-demographic variables) that separately examined the incremental predictive effects of active time in service, deployment status, and presence/recency of a previous mental health diagnosis. Due to the small number of activated RC officers with a documented suicide attempt, some of the predictor categories had to be combined in subsequent officer analyses. Odds-ratios (ORs) and 95% confidence intervals (CI) were obtained by exponentiating the logistic regression coefficients. Using coefficients from the final model, we generated a standardized risk estimate (SRE; ) (number of suicide attempters per 100,000 person-years) for each predictor category. The SREs assume other predictors in the final model are at their sample-wide means. A dummy predictor for calendar month and year was included in all logistic regression equations to control for secular trends in suicidal behaviors during the study period [1–3, 9, 32]. Among enlisted soldiers (the number of officer cases was insufficient), changes in suicide attempt risk across active time in service were further examined in a discrete-time survival model that estimated risk (suicide attempters per 100,000 person-months) in each active month since entering the Army. Enlisted soldiers comprised 84.3% of activated RC soldiers, accounted for 95.7% of activated RC suicide attempters (n = 1056), and had an overall suicide attempt rate of 108/100,000 person-years (95% CI = 106.8–108.3). Officers (commissioned and warrant officers) made up 15.7% of activated RC soldiers and accounted for 4.3% of attempters (n = 47), with an overall rate of 26/100,000 person-years (95% CI = 25.3–26.1). The overall suicide attempt rate for activated RC enlisted soldiers was more than four times higher than the rate for officers (rate ratio = 4.2 [95% CI = 3.1–5.6]). Among enlisted RC soldiers, females were more than twice as likely as males to have a documented suicide attempt. Those younger than 21 years had the highest odds of suicide attempt (OR = 3.9 [95% CI = 3.0–5.1]), with odds decreasing monotonically as age increased. Odds were also elevated among those who were less than high school-educated (OR = 1.2 [95% CI = 1.1–1.4]), currently married (OR = 1.5 [95% CI = 1.3–1.8]), and 25 years or older when they entered the Army (OR = 1.3 [95% CI = 1.0–1.6]). Odds of suicide attempt were lower among soldiers who were Black or Asian (ORs = 0.5–0.8), 40 years or older (OR = 0.6 [95% CI: 0.5–0.8]), college-educated (OR = 0.6 [95% CI = 0.4–0.8]), and younger than 21 when they entered the Army (OR = 0.6 [95% CI = 0.5–0.7]). Standardized risk of suicide attempt was highest for enlisted RC soldiers who were younger than 21 (SRE = 293/100,000 person-years), female (SRE = 221/100,000 person-years), and 25 years or older when they entered the Army (SRE = 203/100,000 person-years) (Table 1). The only socio-demographic variable associated with suicide attempt among officers was gender, with odds being more than three times higher among females (OR = 3.3 [95% CI = 1.7–6.1]) (Table 2). Female gender was also the socio-demographic category with highest standardized risk in the officer population (SRE = 61/100,000 person-years). Adjusting for socio-demographic variables, enlisted RC soldiers in their first two active years of service had higher odds of suicide attempt relative to those with 5–10 active years of service (OR = 1.9 [95% CI = 1.4–2.5]), whereas those with more than 10 active years of service had lower odds (OR = 0.7 [95% CI = 0.5–1.0]) (Table 3). Subsequent pairwise analysis found that the ORs for 1–2 years (0–24 months) and 3–4 years (25–48 months) of service also differed (χ21 = 17.5, p < 0.0001). The standardized risk for enlisted RC personnel with 1–2 years of service (SRE = 160/100,000 person-years) was nearly three times higher than for those with more than 10 years of service (SRE = 55/100,000 person-years) (Table 3). Time in service was not associated with suicide attempt among officers (Table 4). A discrete-time survival model (Fig. 1) demonstrated greatly elevated risk among enlisted soldiers during their first 6 active months in the Army, with risk of suicide attempt ranging from 18 to 32/100,000 person-months and peaking in the 2nd active month of service. From the 7th through the 18th active month of service, risk generally ranged from 10 to 15/100,000 person-months, followed by a decrease to approximately 5–10/100,000 person-months through the 36th active month of service. Monthly risk was not examined among officers due to the small number of cases. 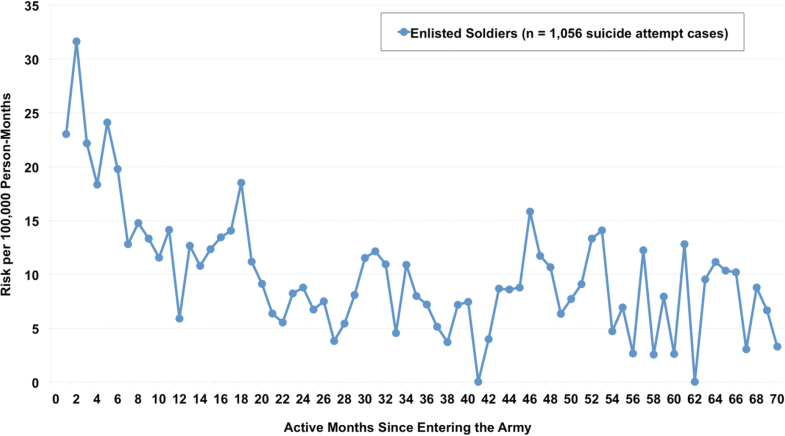 Risk of Suicide Attempt among Activated Reserve Component Enlisted Soldiers by Active Months Since Entering the Army. We found higher odds of suicide attempt among previously deployed RC enlisted soldiers compared to those currently deployed (OR = 1.3 [95% CI: 1.1–1.6]), adjusting for socio-demographic variables (Table 3). Although the OR for never deployed was nonsignificant, a subsequent pairwise analysis found no difference between never deployed and previously deployed (χ21 = 1.7, p = 0.20). Standardized risk was highest for enlisted RC soldiers who were previously deployed (SRE = 129/100,000 person-years) and lowest for those currently deployed (SRE = 93/100,000 person-years). Deployment status was not associated with suicide attempt among RC officers (Table 4). Among those who attempted suicide, 45.1% of RC enlisted soldiers and 63.8% of officers had a previous mental health diagnosis. Among attempters with a history of mental health diagnosis, 69.3% of enlisted soldiers and 56.7% of officers most recently had a diagnosis recorded in the month prior to attempting suicide. Adjusting for socio-demographics, enlisted soldiers with a mental health diagnosis in the previous month had the highest odds of attempt compared to those without a diagnosis (OR = 28.4 [95% CI = 24.7–32.7]), with odds decreasing monotonically as time since most recent diagnosis increased from 2 to 3 months (OR = 6.0 [95% CI = 4.6–7.8]) to 13 months or more (OR = 1.5 [95% CI = 1.0–2.1]) (Table 3). Pairwise analyses found that the differences between those levels were significant (ranging from χ21 = 4.8–173.1, p < 0.0001–0.027). Standardized risk was highest at one month since most recent diagnosis (SRE = 1863/100,000 person-years), substantially lower at 2–3 months since diagnosis (SRE = 399/100,000 person-years), and lowest for RC enlisted soldiers with no history of diagnosis (SRE = 65/100,000 person-years). Officers with a mental health diagnosis in the previous month similarly had the highest odds of suicide attempt (OR = 49.6 [95% CI = 24.3–100.9]), with odds decreasing as time since most recent diagnosis increased from 2 to 3 months (OR = 16.4 [95% CI = 6.2–43.3]) to 4 months or more (OR = 3.1 [95% CI = 1.3–7.7]) (Table 4). Pairwise analyses found that the differences between all other levels of the variable were significant (ranging from χ21 = 6.2–32.0, p < 0.0001–0.013). The standardized risk among officers decreased from 540/100,000 person-years at 1 month since diagnosis to 38/100,000 person-years at 4 or more months since diagnosis, with never-diagnosed officers having a standardized risk of 11/100,000 person-years. By combining multiple administrative data systems, the current study presents the most comprehensive analysis to date of documented suicide attempts among activated RC soldiers during the wars in Iraq and Afghanistan. It complements previous RC research on suicide death [33–35] and ideation (e.g., [15–17]). The findings reveal enlisted soldiers account for the vast majority of RC suicide attempts documented during active duty, with an overall rate more than four times higher than the rate for officers. This rank-based discrepancy in risk was also observed among AC soldiers . Interestingly, while the rates for RC and AC officers are comparable, the rate for RC enlisted soldiers is far lower than the published rate of 377 per 100,000 person-years for AC enlisted soldiers . Previous surveys have found mixed results when comparing RC and AC soldiers on prevalence of suicide ideation and attempts [11, 12, 36]. The lower RC attempt rate in the current study may be attributable to their more limited time on active duty (when suicide attempts are captured by administrative records) relative to AC soldiers. It is also possible that RC soldiers with suicidal thoughts or other mental health symptoms that increase suicide attempt risk are less likely to be activated or remain on active duty for extended periods of time. Among RC enlisted soldiers, the positive associations of suicide attempt with being female, younger, non-Hispanic white, less educated, and older when entering the Army are consistent with findings from the AC enlisted population, as are the higher odds among enlisted personnel who were in their first two years of service, previously deployed, and recently diagnosed with a mental health disorder . Of particular note, RC and AC enlisted soldiers have a similar pattern of monthly suicide attempt risk after entering service , with peak risk occurring toward the end of basic training followed by a sharp decline. Beyond potential differences in the overall attempted suicide rate among activated RC vs. AC enlisted soldiers, our findings indicate two noteworthy differences in predictor variables. First, whereas the multivariable association of marital status with suicide attempt was nonsignificant in the AC enlisted population , currently married RC soldiers were significantly more likely to attempt suicide than those who were never married. Interestingly, previous univariable analyses found that never married RC enlisted soldiers had higher odds of suicide attempt  – a finding that is consistent with the higher crude rate among never married RC soldiers in the current study – indicating that other variables in the adjusted model are influencing the association of marital status. Second, whereas being never deployed had a robust positive association with suicide attempt among AC enlisted soldiers [7, 8], it was nonsignificant among RC enlisted soldiers in adjusted models despite having the highest crude rate. The reason for this discrepancy between RC and AC soldiers is not yet known but may be attributable to differences in socio-demographic and occupational composition (e.g., the U.S. Army Reserve does not have combat units). A more detailed analysis of risk by deployment status  and military occupation  may improve understanding of how the association of deployment status with suicide attempts may differ between the RCs and AC. Previous work found few predictors of suicide attempt among AC officers . Even fewer predictors were identified in this analysis of RC officers, with female gender and recent mental health diagnosis being the only significant variables. However, with only 47 suicide attempt cases, power to detect significant associations among RC officers was limited. We plan to address this limitation in the follow-up study to Army STARRS (STARRS-LS for “longitudinal study”), which will include additional administrative data beyond the original 2004–2009 time period, allowing more officer suicide attempt cases to be captured and increased statistical power. Several limitations in the current study are noteworthy. First, administratively recorded suicide attempts are limited to events captured by the healthcare system. These records are subject to errors in coding and clinical judgment, as well as changes in policy and procedures. Second, the data are limited to person-months during which individual RC soldiers were federally activated. Consequently, these records do not include suicide attempts or mental health diagnoses that occurred while soldiers were inactive, and time in service should not be interpreted as continuous (e.g., 12 months of active service may not correspond to 12 consecutive calendar months). Third, findings represent activated RC soldiers during 2004–2009 and may not generalize to other time periods or populations. Fourth, deployment and Army attrition are non-random events [38–40], which influences the composition of groups defined by those variables. Therefore, differences based on deployment status and active time in service should not be interpreted as within-person changes over time. For example, it is possible for soldiers who are currently deployed to have also been previously deployed. This means the currently deployed group includes soldiers on their first deployment as well as soldiers on their second deployment, third deployment, etc. Those on their first deployment are likely to have the highest risk of adverse outcomes (which could preclude subsequent deployments), whereas those on their second or third deployment are likely to be more resilient soldiers who were purposefully selected to deploy multiple times (often referred to as the “healthy warrior effect”). With the limitations in mind, the findings indicate that enlisted soldiers in their first two years of active service account for the majority of suicide attempts in the RC population, and soldiers with a recently documented mental health diagnosis are at substantially elevated risk. Although predictors are largely consistent with those found in the AC , there were some notable differences (e.g., marital status, deployment status). Most significantly, the intermittent nature of RC service creates unique challenges for risk assessment and intervention that are not present in the full-time AC population. AC soldiers in garrison have military healthcare access and can be closely monitored by leaders and clinicians. In contrast, deactivated members of the RCs do not have access to the military healthcare system, and they return to communities that are widely dispersed, often rural, and potentially remote, presenting obstacles to mental health screening and treatment . Addressing these challenges may require new programs, such as peer-to-peer support , that can reach RC soldiers in their local communities. Army liaison/consultant: Kenneth Cox, MD, MPH (US Army Public Health Center). Other team members: Pablo A. Aliaga, MS (Uniformed Services University of the Health Sciences); COL David M. Benedek, MD (Uniformed Services University of the Health Sciences); Laura Campbell-Sills, PhD (University of California San Diego); Carol S. Fullerton, PhD (Uniformed Services University of the Health Sciences); Nancy Gebler, MA (University of Michigan); Robert K. Gifford, PhD (Uniformed Services University of the Health Sciences); Paul E. Hurwitz, MPH (Uniformed Services University of the Health Sciences); Sonia Jain, PhD (University of California San Diego); Tzu-Cheg Kao, PhD (Uniformed Services University of the Health Sciences); Lisa Lewandowski-Romps, PhD (University of Michigan); Holly Herberman Mash, PhD (Uniformed Services University of the Health Sciences); James E. McCarroll, PhD, MPH (Uniformed Services University of the Health Sciences); James A. Naifeh, PhD (Uniformed Services University of the Health Sciences); Tsz Hin Hinz Ng, MPH (Uniformed Services University of the Health Sciences); Matthew K. Nock, PhD (Harvard University); Nancy A. Sampson, BA (Harvard Medical School); CDR Patcho Santiago, MD, MPH (Uniformed Services University of the Health Sciences); LTC Gary H. Wynn, MD (Uniformed Services University of the Health Sciences); and Alan M. Zaslavsky, PhD (Harvard Medical School). Army STARRS was sponsored by the Department of the Army and funded under cooperative agreement number U01MH087981 (2009–2015) with the U.S. Department of Health and Human Services, National Institutes of Health, National Institute of Mental Health (NIH/NIMH). Subsequently, STARRS-LS was sponsored and funded by the Department of Defense (USUHS grant number HU0001-15-2-0004). As part of the Army STARRS cooperative agreement, scientists employed by NIMH (Colpe and Schoenbaum) and Army liaisons/consultants (COL Steven Cersovsky, MD, MPH USAPHC and Kenneth Cox, MD, MPH USAPHC) collaborated to develop the study protocol and data collection instruments, supervise data collection, interpret results, and prepare reports. Although a draft of this manuscript was submitted to the Army and NIMH for review and comment prior to submission, this was with the understanding that comments would be no more than advisory. Under STARRS-LS, the role of the Department of Defense does not extend beyond the sponsorship and funding of this research. The contents are solely the responsibility of the authors and do not necessarily represent the views of the Department of Health and Human Services, NIMH, or the Department of the Army, or the Department of Defense. For information on data availability, please contact the Uniformed Services University of the Health Sciences Institutional Review Board, 4301 Jones Bridge Road, Bethesda, MD 20814. CSF, HBHM, JAN, MBS, RCK, and RJU contributed to the study concept and design. CARD, CSF, GHW, HBHM, HMD, JAN, MBS, NAS, OIG, RCK, RJU, THHN, and TK were responsible for the acquisition, analysis, or interpretation of the data. CARD, CSF, HBHM, JAN, OIG, RCK, and RJU were involved in drafting the manuscript. CARD, CSF, GHW, HMD, HBHM, JAN, MBS, NAS, OIG, RCK, RJU, THHN, and TK contributed to critical revision of the manuscript for important intellectual content. CARD, CSF, GHW, HBHM, HMD, JAN, MBS, NAS, OIG, RCK, RJU, THHN, and TK provided administrative, technical, and material support. All authors read and approved the final manuscript. This component of Army STARRS was approved by the Institutional Review Boards of the Uniformed Services University of the Health Sciences for the Henry M. Jackson Foundation (the primary grantee), the University of Michigan Institute for Social Research (site of the Army STARRS Data Enclave), University of California, San Diego, and Harvard Medical School, which determined that the present study did not constitute human participant research because it relies entirely on deidentified secondary data. MBS has been a consultant for Care Management Technologies, received payment for his editorial work from UpToDate and Depression and Anxiety, and had research support for pharmacological imaging studies from Janssen. In the past 3 years, RCK received support for his epidemiological studies from Sanofi Aventis; was a consultant for Johnson & Johnson Wellness and Prevention, Shire, Takeda; and served on an advisory board for the Johnson & Johnson Services Inc. Lake Nona Life Project. RCK is a coowner of DataStat, Inc., a market research firm that carries out healthcare research. The remaining authors report nothing to disclose. Millner AJ, Ursano RJ, Hwang I, King A, Naifeh JA, Sampson NA, Zaslavsky AM, Stein MB, Kessler RC, Nock MK. Prior mental disorders and lifetime suicidal behaviors among U.S. Army soldiers in the Army study to assess risk and resilience in Servicemembers (Army STARRS). Suicide Life Threat Behav. (Epub ahead of print). https://www.ncbi.nlm.nih.gov/pubmed/28926674.